Imec, the distinguished Belgian research center has invented a new and cost-effective method of cooling chips. This achievement can be an important innovation to tackle the ever-increasing cooling demands of high-performance 3D chips and systems. Present powerful electronic systems have high cooling demands for integrated semiconductor chips. Conventional solutions operate with various passive (or occasionally active) heat sinks. The main bottleneck in the heat-transfer path occurs at the interface between the semiconductor and the heat sink. It is proven that direct cooling on the back of the chip is more efficient, but current microchannel solutions do more harm than good. It leads to stress and a temperature gradient across the chip surface. Thus a new way of cooling in that method was much needed. The ideal solution is to use an impingement-based cooler with coolant outlets distributed across the chip’s surface area. This system directs the liquid perpendicular to the chip surface and ensures the liquid is at the same temperature throughout. It also reduces contact time between the coolant and the chip. Until now, cooling solutions based on this principle have the disadvantage of being very expensive. In some other alternative implementations, the nozzle diameter and necessary fabrication techniques are not compatible with chip packaging processes. 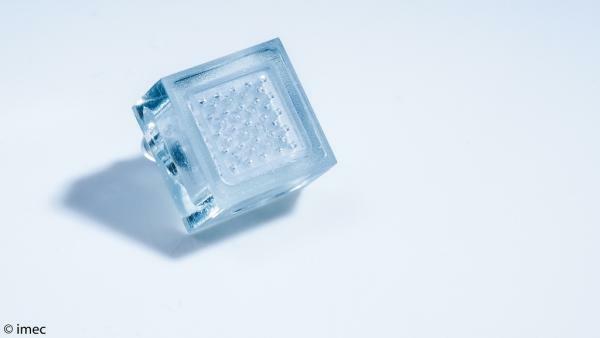 Imec has developed a new impingement chip cooler that uses polymers instead of silicon, to achieve a cost-effective fabrication. Moreover, imec’s solution features nozzles of only 300µm diameter, made by high-resolution stereolithography 3D printing. The use of 3D printing allows customization of the nozzle pattern design to match the heat map and the fabrication of complex internal structures. Moreover, 3D printing allows to efficiently printing the whole structure in one part, reducing production cost and time.